Cutting in refers to painting neatly up to an edge or other surface, neatly and without getting paint where you don't want it. Over the last week or so I have been painting my outside verandah eaves. 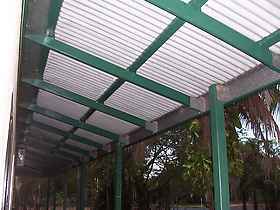 I have a verandah that runs all around the house and the eaves are not lined, but open, so I have had to paint the exposed rafters and ceiling battens. Cutting in at the edges of the battens up against the underside of the roof sheeting has been a pain in the proverbial. After struggling for a while, I had a brainwave, that has improved my accuracy and performance tenfold. 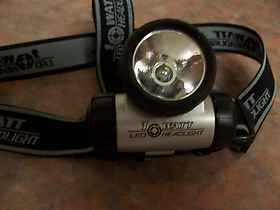 I went and bought one of these little LED headlight torches, Absolute magic. I have it on one third power to conserve the batteries, and now I find that I can see into the shaded hard to see places. Also I was having to shade my eyes from strong backlight when painting the shaded interior and looking towards the bright sunlight outside. The results where so improved, that I am now wishing that I had used it when I was painting inside the house also. Still on painting. I was moving my dropsheets a lot of course and I got to thinking that because I buy fairly cheap dropsheets I can't actually remember the time I bought one with a logo printed on one side. My old mate who is a retired house painter says that it was common for even small painting firms to have their own name printed on them. You may say, why bother? The reason is to clearly show which side up the sheet is. Always keep it the same way up, with the perfectly clean side down. Take my case, I am a sloppy painter and have heaps of wet drops on the sheet, I bundle it up and carry it into the next room. If spread it out upside down I risk leaving smudgy paint marks on the floor that I am trying to protect. Same thing if I am using them as dust sheets to protect furniture etc when doing dusty building work. When I dropped a section of my ceiling recently there was heaps of dust and itchy insulation debris collected on the sheet. Shaking it out shifted most of the stuff, but the last thing I want is to have the dirty side down when I cover the bed when painting the ceiling later on. Leave cutting in and back to home page.